Home>Music> What Does SoundCloud Fame Mean In The Long Run? Since its inception in 2007, SoundCloud has fundamentally changed the way that artists share their music with a wider audience. The platform provides artists both big and small the opportunity to upload three hours worth of music free of charge. It also allows users to repost and share music on their own profiles and elsewhere online with ease. For rising rappers and producers looking to grow their fan bases, this has altered how they interact with other members of the hip hop community and gain exposure. Although Spotify, Apple Music and other more traditional streaming platforms remain incredibly lucrative and popular, SoundCloud offers something much more unique and valuable to independent artists: easy access and entrance to the industry without having to deal with any of the red tape. Now so more than ever, the careers of artists often begin on SoundCloud, and some of the most recognizable names in the industry owe much of their success to their humble beginnings on the platform. Post Malone uploaded his debut single “White Iverson” to SoundCloud in February 2015. The song became a massive hit overnight, and within a month’s time, it had easily gained over a million plays. Malone went on to sign a deal with Republic Records and hasn’t looked back since; with “White Iverson” now certified five-times platinum, he’s become one of the biggest artists worldwide. The unimaginable success of “White Iverson” and songs like it have spawned innumerable artists looking to duplicate that same level of viral success, often times with nothing more than a laptop and a microphone. YBN Nahmir burst onto the SoundCloud scene in the summer of 2017 with the irresistibly catchy “Rubbin Off the Paint,” which features the famous SpongeBob tag used by producer Izak. According to Nahmir, he recorded the viral hit in his bedroom using a $50 microphone with a sock covering it to act as a pop filter. In similar fashion, the accompanying music video was filmed in one take due to Nahmir and his friends having school the next day. Now, it has over 100 million views and is the most watched video on the WSHH YouTube page. YBN Nahmir’s story is not a unique one in the sense that plenty of other artists share similar experiences. He is part of a new generation of SoundCloud rappers who have managed to obtain success on the platform through charisma, striking new sounds and styles, and more often than not, a lot of luck. Though “SoundCloud rap” has become somewhat of a nondescript, pejorative term, it is undoubtedly a fixture of the music industry. Each year, there is new crop of young artists who exhibit potential, yet eventually fade away to make room for the next wave. With a seemingly never ending onslaught of artists and producers, projects, and subgenres that seem to pop up out of nowhere, it can be overwhelming to try to keep up with the who’s who of SoundCloud rap. Given how much music is constantly being released, artists have to find innovative, new ways to adapt to the ever-changing musical landscape for fear of becoming irrelevant. As a result, SoundCloud rap is increasingly based on shock value; with little regard for their future, artists scramble to separate themselves from the pack in a mad dash for 15 minutes of fame. For every success story, there is a cautionary tale to be told. 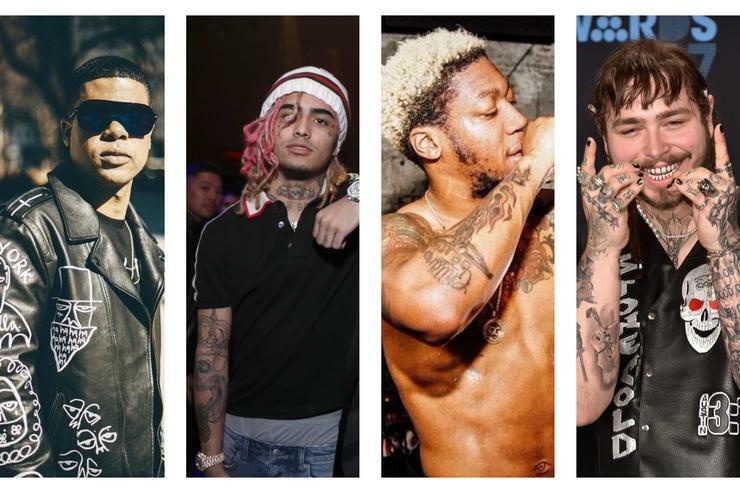 Yes, there are a number of SoundCloud famous artists who have managed to achieve long term success: Post Malone, Lil Uzi Vert, and Bryson Tiller are some of the most notable names. But there are also artists who achieve massive viral success on the platform that have since seen their careers stutter and falter: OG Maco with “U Guessed It”; Trinidad James with “All Gold Everything”; Dae Dae with “Wat U Mean (Aye, Aye, Aye)”; and Rob $tone with “Chill Bill” are just a few examples. To be fair, it’s not always their fault; the industry has become increasingly unforgiving for small artists and creators who make quality content yet don’t produce on a frequent enough basis to maintain the attention of their audience. Dizzy Wright is another prime example: he’s a proven lyricist with projects like The Golden Age that stand as a testament to his talent, yet he hasn’t been able to keep pace with the times. The industry is now so oversaturated that artists like Drizzy Wright get a brief taste of success before the rug is seemingly, and cruelly, ripped out from under them. That being said, many young artists who come into large sums of money very quickly upon hitting the SoundCloud jackpot make poor decisions and end up signing their own death warrant. D Savage, the 19-year-old rapper best known for his viral SoundCloud hit “I Know II,” is one such artist; he was recently singled out by DJ Akademiks for flexing money that he had received from his label, Republic Records. This seems to be one of the biggest issues when it comes to the alarmingly high turnover rate being observed with SoundCloud artists: the mismanagement of time and money. How an artist chooses to spend such valuable assets upon achieving SoundCloud fame has a significant impact on their career prospects. It seems like a no brainer, but it could not be more true. If a label discovers and signs a SoundCloud artist who they believe will be able to turn a profit for them, then that is a win-win situation for both parties: the label has acquired the rights to the music of an artist who they deem to be a worthwhile investment, and the artist in turn has the backing of a distributor with connections and a great deal of money. Unfortunately, there remains a destructive illusion in the music industry that with sudden fame comes sudden riches, when the fact of the matter is that the big checks often don’t come down the pipeline until months, sometimes even years later. As a result, many young artists feel the need to put on a facade of wealth and success, even though they may not be in a position to be making exorbitant purchases just yet. They choose not to reinvest in themselves, but instead to spend their money on things that quickly depreciate, such as cars, clothes, and jewelry. Part of the problem is that material wealth continues to attract a great deal of attention from eager spectators, particularly on social media. Tekashi 6ix9ine’s Instagram video of his custom $300,000 chain has over five million views and 14,000 comments, and Trippie Redd’s video of his his own monstrous $200,000 chain attracted similar attention before it was taken down. These money sinkholes into which many young artists continue to throw their cash are exactly what more seasoned veterans in the music industry, such as 2 Chainz and 21 Savage, have chosen to avoid. This is the cruel paradox: artists look for that one viral hit that could jump start their career, only to be derailed either by costly decisions or by the system in place that pushes young, impressionable artists to sign inadvisable contracts, after which they end up wasting away their time and talent. ILoveMakonnen is an example of an artist who achieved viral success on SoundCloud and went on to sign a label deal without understanding the financial consequences of his actions. His 2014 single “Tuesday” was already a hit, but he got thrust even further into the spotlight after Drake chose to hop on the remix. Makonnen went on to sign with Drake’s label OVO Sound, but by his own account experienced setback after setback in his attempts to release new music. Less than two years later, he parted ways with OVO. One would think that Makonnen would have no problem maintaining his success after “Tuesday,” especially given that he had the backing of one of the most highly sought after artists in Drake; yet that success never materialized, and Makonnen’s career has since plummeted. Another significant problem with the way that SoundCloud fame manifests itself is that it rewards consistency and shock value over all else. Staying relevant is now more of a chore than ever: artists are mercilessly pitted against the clock and the media, which has become increasingly more interested in quantity over quality in its search for the next big thing. The theatrical nature of SoundCloud rap plus the inflation of larger-than-life characters and personas has created a new musical ecosystem that has entirely different rules from the mainstream. Artists like Lil Pump, Lil Xan, and Tekashi 6ix9ine have redefined SoundCloud virality with wild stage antics, controversial social media presences, and outlandish, often times uncategorizable music that stands in stark contrast to the more streamlined aesthetic of the mainstream. Their online presence, then, is oft maintained by all of the above factors. There are some who have opted to circumvent the current system that funnels SoundCloud-famous artists into the mainstream meat grinder. $UICIDEBOY$, Pouya, and Xavier Wulf are excellent examples of artists who have independently cultivated micro-movements to reap the benefits of their own distinct sections of the market. With the support of loyal fan bases, they have effectively invested in the long term stability of their brand without having to go through the established gatekeepers of the industry. This unorthodox strategy has proven itself to be profitable, if for a select few. In the long run, SoundCloud fame can mean a lot or very little; though some factors are out of their control, an artist’s future success is largely dependent on the steps that they take to invest in themselves and the music that they are producing. 2017 proved to a critical period for many of the biggest names now dominating headlines and topping charts, and we may yet look back on the past year as a pivotal moment for hip hop. Nonetheless, the longevity of the SoundCloud rap movement that continues to generate one viral success after another remains unclear. The increasing importance of social media when it comes to generating buzz, paired with the realm of endless possibility that is SoundCloud, has created an environment that allows artists to skyrocket to relevancy and fall just as fast. It’s becoming even more treacherous by the day, with SoundCloud fame seeming all the more tenuous for those willing to risk it all. One thing is clear: mastering SoundCloud virality and planning for the future are two very different things that many young artists cannot seem to reconcile. MUSIC What Does SoundCloud Fame Mean In The Long Run?